If you are just getting started with marketing your real estate website, you have likely heard that search engine optimization (SEO) is how your site gets found in search engines and on the web. However, SEO is not easy to tackle. With the rules of search engine rankings constantly changing, it can be an overwhelming challenge to get your site to appear at the top of searches. There is one thing you can do however, that is more powerful than anything else affecting your SEO; create content. 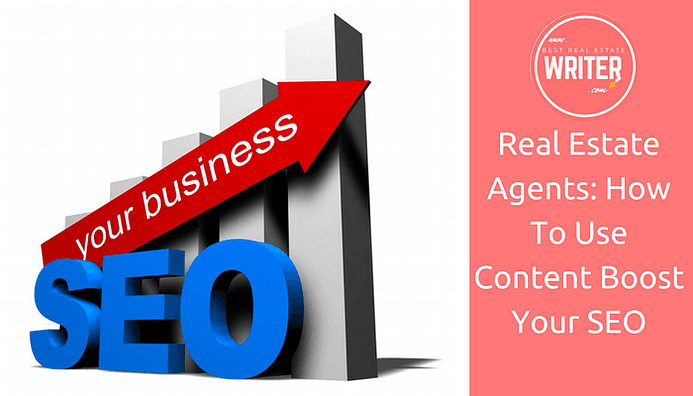 You probably didn't know that real estate content creation and marketing is essential to boosting your SEO. In fact, 30% of companies say ranking higher in search engines is one of their primary content marketing goals, surpassed only by brand awareness (49%). In other words, if you want buyers and sellers to find you first on the internet, you NEED relevant, well-marketed real estate content...and a lot of it. So what kind of real estate content should you be producing? Keywords are one of many ways to get your website to the top of search engines. The goal with keywords, is to find ones that are relevant to real estate in your area and have low competition. Real estate bloggers like myself use intensive keyword research when creating content like blog articles to determine what to write about to get you to the top of search engines. It is also important to use those keywords in the correct places (titles, alt tags, etc.) and in the correct frequency to maximize their power. Want to learn more about using real estate content to find more buyers and sellers? Follow this blog about content creation for real estate agents.